Maybe it's because I am a sucker for anything yoga. Or maybe it was that pose we did in yoga class one day, Finger and Toes Entwined. It's self-explanatory: to put space between your toes, you wedge your fingers in. Problem: I hate touching feet. Yuck to others' and yuck to my own. I endured the asana and wished there were another way to practice this pose that promises greater strength and stability. Ask and ye shall be given. I began seeing ads for YogaToes. Christmas was coming up so I put them on my list. Mom came through, and I've been practicing Finger and Toes Entwined ever since (while I type!). It's like wearing braces on my toes, and consequently I am having an easier time with balance poses. And boy, does it feel good to wear these at the end of the day. I can feel the release of tension radiating up my calves and shins. Here are some of the other benefits touted on the YogaToes website. At $50 (or $99 for 3 pairs), YogaToes are somewhat of a splurge. And you can get cheaper knock-off versions, I've discovered, at discount stores. 1. 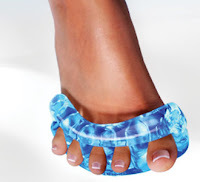 YogaToes (made in the USA, with two patents pending), have two openings to help you get them on easily -- one on the side of the big toe and one of the side of the pinky toe. Other brands have no such design feature and are more difficult to get one. In addition, I've heard reports that cheaper models are not only harder to work with but may also be uncomfortable -- the gel spacers are not as custom-molded to the foot. Just in time FOR your Valentine (or a hint TO your Valentine on what to get you). YogaToes come in 9 colors and 2 sizes. Hurry -- you must get your order in by February 28 to get the discount. YogaToes can ship anywhere, but only those in the US and Canada can order via the website. Others please call to place an order using the special code. I have seen these advertised and thought there was NO WAY they would be good for anything. Now you've made me want them! I love mine too! I bought these a year or so ago, and try to use them a couple times a week. I usually put them on while I'm relaxing in the bath with a good book! Anon -- I hear ya. I never bothered with the knock-offs, but everything I've heard says that they just don't work as well.